Compliance with IMO Tier III regulations requires an 80% reduction in NOx emissions– compared to Tier I– within the designated emission control areas (ECAs) over a defined test cycle. MAN Diesel & Turbo has developed two main approaches to comply with these challenges: Selective Catalytic Reduction (SCR), which involves the catalytically accelerated reaction of nitrogen oxides with ammonia to form water and nitrogen, and Exhaust Gas Recirculation (EGR), which works by re-circulating a portion of an engine’s exhaust gas back to the engine cylinders. 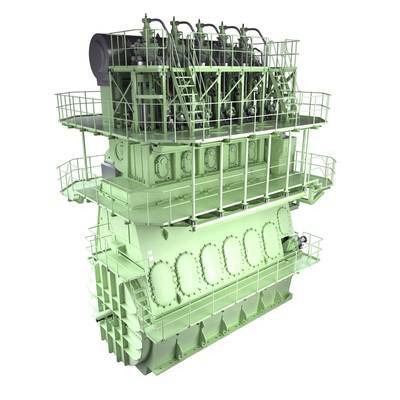 The ME-GI engine gives ship owners and operators fuel flexibility based on price and environmental considerations. MAN Diesel & Turbo sees significant opportunities arising for gas-fuelled tonnage as fuel prices rise and modern exhaust-emission limits tighten. MAN Diesel & Turbo’s G-type program entered the market in October 2010 with the entry of the G80ME-C9 model. The G-types have designs that follow the principles of the large-bore, Mark 9 engine series that MAN Diesel & Turbo introduced in 2006. Their longer stroke reduces engine speed, there by paving the way for ship designs with unprecedented high-efficiency. 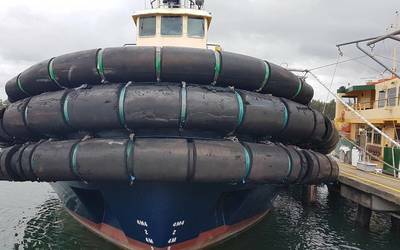 Such vessels may be more compatible with propellers with larger diameters than current designs, and facilitate higher efficiencies following adaptation of the aft-hull design to accommodate a larger propeller. It is estimated that such new designs offer potential fuel-consumption savings of some 4-7%, and a similar reduction in CO2 emissions. In this respect, the fuel savings and performance characteristics for propellers featuring MAN Diesel & Turbo’s unique Kappel blade design have been well documented in recent years. Simultaneously, the engine itself can achieve a high thermal efficiency using the latest engine process parameters and design features. Since its introduction, close to 900 engines bearing the G-prefix have been ordered (including, now, 15 × G95 units), representing a total power output of some 15.9 GW. Of these, over 100 G-type engines have already entered service.